A simple, powerful way to give your body a vacation from sugar and processed foods. Over the course of five weeks, I will guide you and a small group of participants through a REAL FOOD sugar detox, including preparation, implementation, and celebration of success. While in my private practice I specialize in feminine health issues, I welcome all adults to join my RESTART® classes! The program focuses on how to use nutrient dense foods to boost your energy, reduce inflammation, and get rid of sugar and carb cravings. Discover how good you can feel when you RESTART® your health! Week One - Are you ready? Learn how to prepare mentally, physically, and emotionally for your successful transition into the sugar detox. No cleanses or juice fasts here – just satisfyingly simple REAL FOOD. Week Two - How's your digestion? Learn how it’s designed to work and how to optimize your digestion to get the most out of your healthy diet. Week Three - What's the big deal about sugar? Learn how your body responds to excess sugar and refined carbs, and how to feel calm and satisfied between meals. Week Four - Think fat makes you fat? Learn the truth about dietary fats and why healthy fats are essential to your diet. Learn which ones to avoid, and which ones to enjoy. Week Five - It's time to celebrate! The sugar detox is complete, and you reflect upon all the benefits you have experienced. Learn how to successfully re-introduce nourishing foods as you move forward, integrating the skills you’ve acquired through The RESTART® Program. The RESTART® Program is a series of five weekly classes that meet for 1½ hours each. 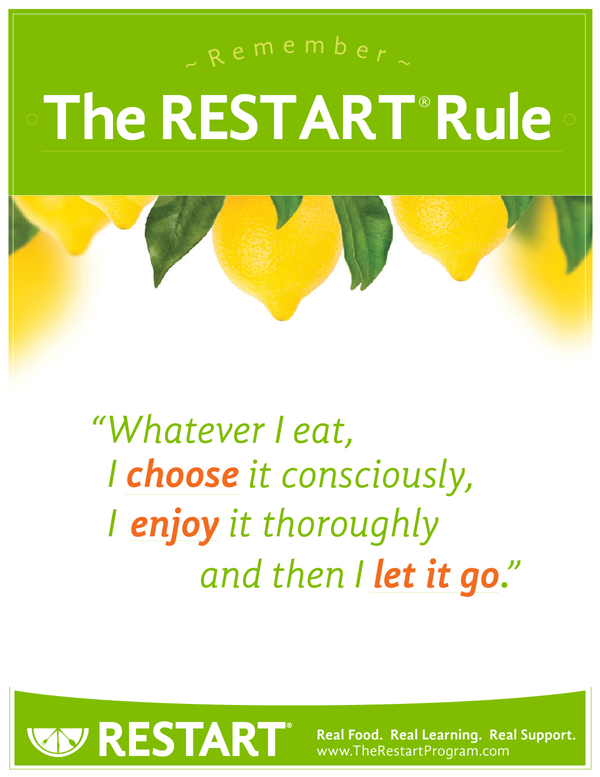 I offer The RESTART® Program in two formats: both In-Person and Online. Both formats are limited to 10 participants. In this small-group setting, a supportive network develops as we get to know each other, which allows each participant to be heard. My In-Person programs are based in the Coeur d’Alene, Idaho / Spokane, WA area. If you prefer an Online program, you may register from anywhere! I use the Zoom conferencing platform to conduct the classes live. The classes are not pre-recorded for later viewing, as one of the biggest benefits of The RESTART® Program is interaction with classmates! All program start dates are announced on this website (see below). The cost for the In-Person class is $199 per person. The Online class costs $149 per person. They both consist of five weekly 1½ hour meetings. RESTART® has made a huge difference in how I shop for food, how I prepare it, and the amount I eat. I feel in control of what I put in my mouth and have lost weight healthfully because of it. I learned more about food and how it interacts with my body in this five week program than I did in my previous fifty years. This program can be life changing. I truly thank you with my entire heart. I didn’t realize how feeling bad had become my “new normal” until I went through the RESTART® program. I feel so much better now and believe I have the tools I need to change my approach to food and healthy eating. I’m a dentist and we had plenty of medical education in school. However, one subject that was seriously lacking was nutrition. I learned so much during the class! (And that’s coming from a guy who thought he already knew everything – you know doctors.) Since I’ve cut out sugar from my life and adopted the changes you teach, my joint aches and back aches are almost gone, my feet don’t hurt anymore when I walk, I’ve lost weight, I feel and look better, I sleep better, and I can eat bacon (and anything) without guilt!! Thank you for teaching me the truth about food and nutrition. Note: Entering your email address does not sign you up for newsletters or promotional material from Allison Mädl, Nutritional Therapy and Education.